If you’re looking to kick-start your career in the business sector, this course could be a perfect starting point. This practical work-related programme will introduce you to a broad range of business functions and processes. Through project based learning and work experience you’ll be encouraged to develop your skills and knowledge of business organisations, financial forecasting, marketing, IT, human resources and other key areas. Robbie is an ambitious future businessman who chose our course specifically to learn how to run his own company. 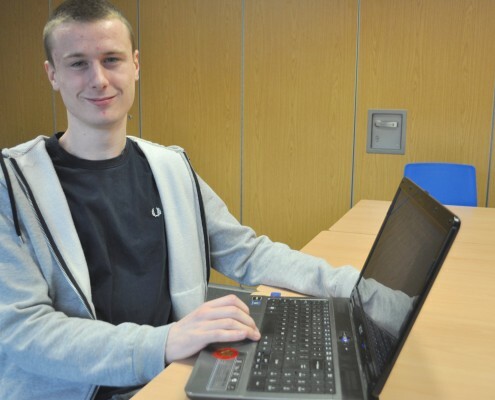 He completed his work placement in our own busy finance office, checking invoices and even suggesting where we might make savings. This very relevant experience has obviously stood him in good stead, as he has now gained a 12 month placement through a local company which specialises in IT apprenticeships for young people. Robbie would like a job incorporating IT and business and eventually to run his own company.